Sand. It’s the worst. When it comes to the things that my kids love to play with that I hate with the fire of a thousand suns, the list has three items: sand, glitter, and play-doh. But sand, man, it’s the worst. It was great when the girls would only want to play in it when we were at the beach. But, with the invention of things like kinetic sand, they wanna play with it ALL.THE.TIME. It gets everywhere. Outside. Inside. Upside. Downside. In short, the sand goes everywhere. Could that be because we didn’t have a proper place for them to play–AND LEAVE–said sand? I say yes. I hope I’m right. So what’s a dad-of-sand-lovers to do? Answer: Sandbox. I didn’t want to go out and buy one of those giant plastic sandboxes from the store. What’s the fun in that, anyway? Besides, we’re not exactly flush with cash to go out and drop dough on a sandbox that will sit on the ground and turn into a litter box for the neighborhood cats. No, no, no. I decided I’d make one myself! Amazing handyman I am not, though. I knew that I’d need a little help to tackle what should be an easy project. 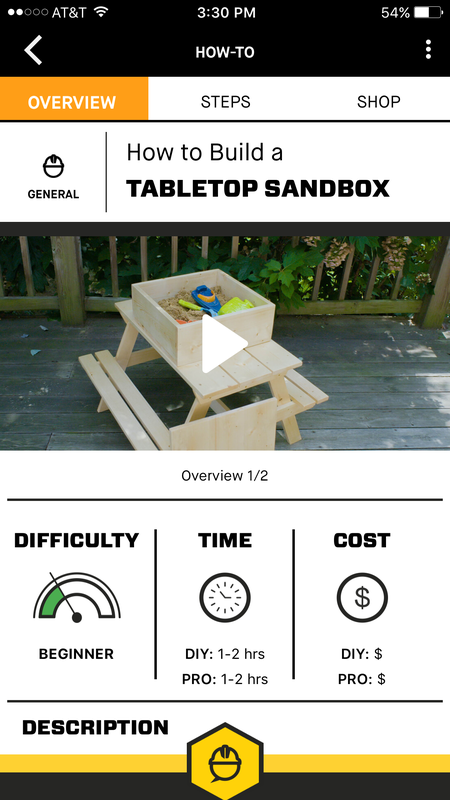 No, I didn’t ask someone else to do it… I downloaded the DIYZ app on my phone, did a quick search for sandboxes, and found a beginner-level tabletop sandbox project. 1-2 hours project time? CHECK AND CHECK, FOLKS! Like I said, I’m not a very good handyman (my short experience working for my Uncle David’s construction business notwithstanding). I can fix a few things here or there, but when it comes to building something, it’s not my forte. 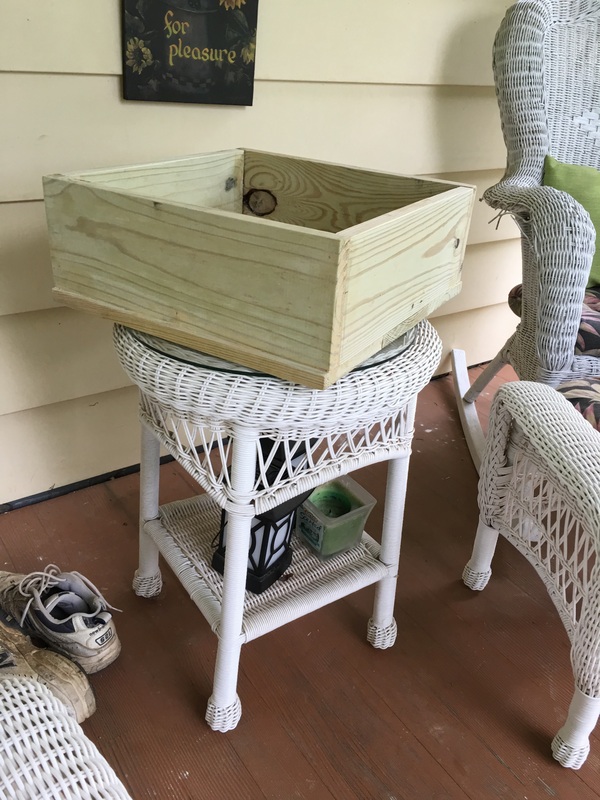 I quickly scrolled through the step-by-step instructions to see exactly I was going to need to get this totally-not-a-litter-box sandbox completed. Some wood, screws, wood glue, nails, and sandpaper? I can handle that! Luckily, the tools I needed were all within arm’s reach for me (thanks John! ), so I didn’t need to go out and hunt for them at the hardware store. But, if I did need tools, there’s a shop section right in the project portion of the app which you can directly purchase through the app via Amazon. So had I needed tools, BOOM! RIGHT THERE. Easy as it comes, folks. So, we get to work on the sandbox. 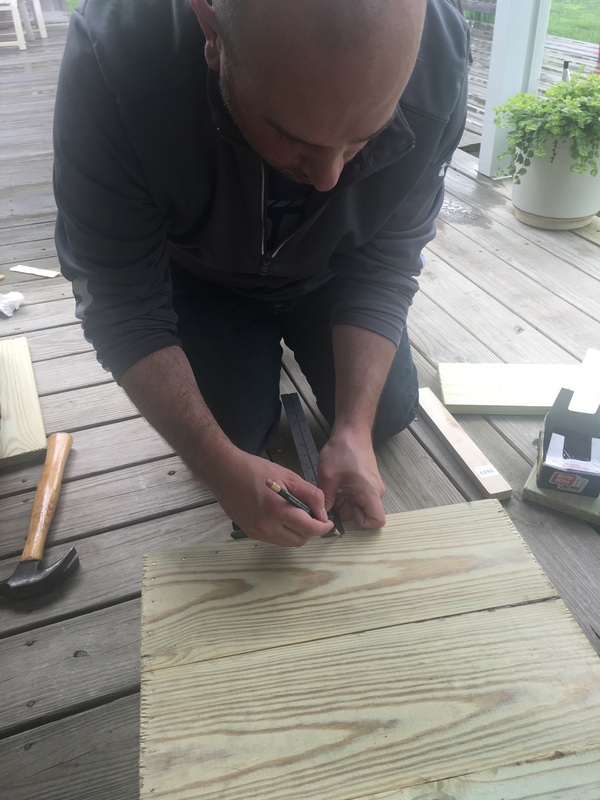 The girls wanted to help, but being only six and three, they weren’t exactly interested in the finer points of building… really all they wanted to do was take the hammers and hit the wood. Which was fine–I’m really glad I had some wood scraps left over for them to knock around a bit (safely of course). They did ask lots of questions. Such as “Daddy, do you know what you’re doing?” No. “Daddy, why do you keep looking at your phone?” Because that’s where I’m learning how to do the project, girls. “Daddy, what’s this little yellow thing that keeps popping up at the bottom of your directions?” That’s the Pro Advisor feature of the DIYZ app, you guys, in case Daddy can’t figure out what he’s doing, then he can video chat with a professional who DOES know what they’re doing. Cool, huh? Like I said above, the project was listed at 1-2 hours for a beginner level. It took me a bit longer than that to get through it. I blame the on-again, off-again rain that kept coming and going throughout the day. If you’ve ever seen me swing a hammer (stop laughing! 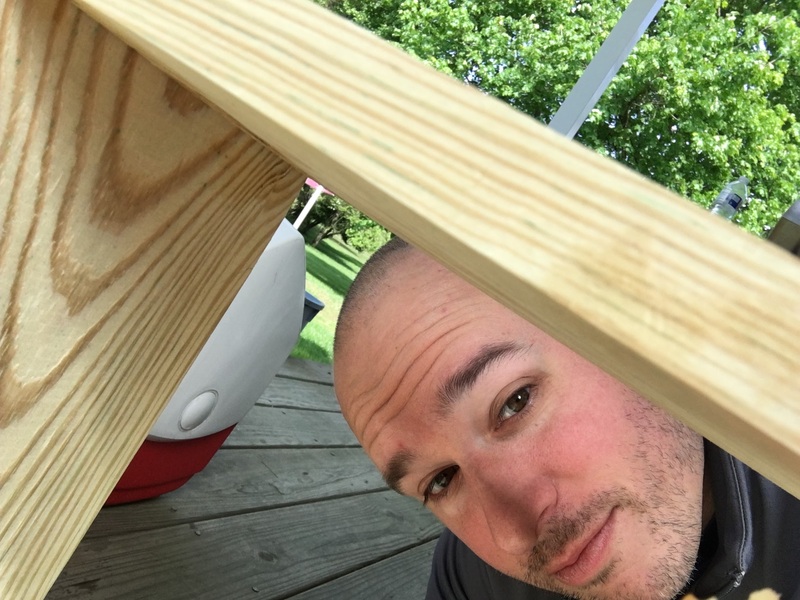 ), would you guess that I was able to get the sandbox built and sanded without even once hammering my thumbs? Small victories, but victories, nonetheless! Just look at that sandbox, it just screams “Come see how good I look!”, doesn’t it? I thought so, too. In all honesty, using the DIYZ app was a HUGE help for me. For someone who isn’t do-it-yourself-inclined, it was perfect. Clear step-by-step instructions, videos with each step to show me exactly what to do, and the chance to talk to a pro if needed. The DIYZ app is free to download and is available in the Apple App Store for iPhone and Google Play for Android. And for a limited time, even the video-chat feature is free!